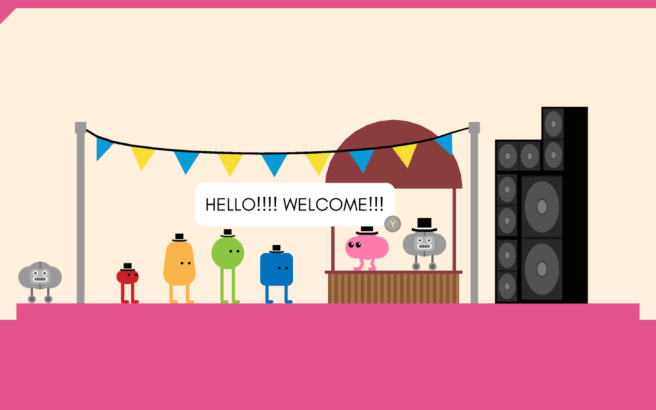 Developer Sectordub and publisher Devolver Digital have announced Pikuniku for Switch. The game, a puzzle-exploration game, is slated for launch in 2018. Pikuniku is an absurd puzzle-exploration game that takes place in a strange but playful world where not everything is as happy as it seems. Help the townsfolk face their fears, uncover a deep state conspiracy, and rebuild a cheerful community in a delightful dystopian adventure! – A Vibrant Adventure: Explore a colorful world at your own pace, help quirky characters with their unusual requests, and solve clever puzzles all without hurting anyone at all. – Charming Cast: An eccentric mayor leads a village full of peculiar characters full of worry and trepidation as their perfect world teeters on the verge of chaos. Help them out, make some friends, and bring this community back together through your good deeds! – Cooperative Mode: Join up with a friend for local multiplayer fun in an original cooperative mode with more than a dozen handcrafted levels full of splendid puzzles and good times. View a trailer for Pikuniku below.